Creative Backyard Concepts is not only here to assist you with designing and building your homes deck, we strive to educate and provide transparency with our deck building services. Below you will find helpful information about our deck services in San Antonio, Texas. Feel free to contact us with any questions. 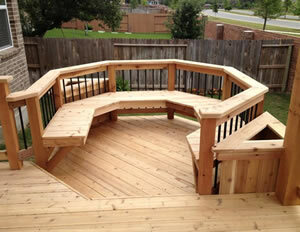 Are you looking for a deck contractor in San Antonio, TX? Better deck building by design is something Creative Backyard Concepts stands behind, and aspires to live up to everyday. In addition to beautiful custom deck building, we pride ourselves on providing thorough design services so you can know how perfect your outdoor space will be before construction begins. From start to finish, you can be confident you've hired a company that conducts business with professionalism, exhibits integrity, is committed to high-quality deck standards, offers a great warranty and has a history of satisfied clients. 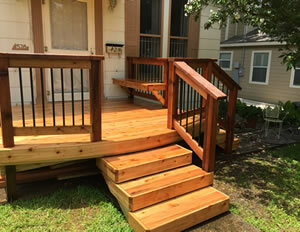 Deck repairs and refinishing means re-establishing the beautiful look of your valuable wood deck with use of proven restoration techniques. Wood decks take an incredible amount of abuse from sun, rain, dirt, and foot traffic because it is a horizontal surface. Over time the harsh effects of weather will naturally oxidize the surface of the wood giving it a gray color appearance. 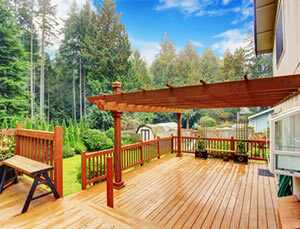 Sun and moisture can cause inferior deck coatings to fail prematurely. Our deck repair and refinishing techniques can restore all wood decks back to new no matter how deteriorated they have become. Whether you have design ideas of your own, or you're starting from scratch, you'll discover Creative Backyard Concepts can create a deck design and plan that will be amazing and functional. With years of deck building experience we understand all the little touches that make a huge functional and visual impact for your deck. And while we're dedicated to bringing you the highest quality and exquisitely finished details, we're happy to work with you to make your project affordable. A beautiful, quality deck can be well designed and offer high quality materials with out being overly expensive.